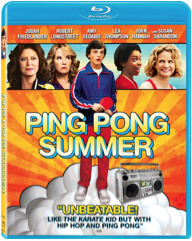 OVERVIEW: Millennium Entertainment is proud to announce that audiences can bring home the funky, fresh coming-of-age comedy, Ping Pong Summer on DVD and Blu-Ray™ starting August 5, 2014. Directed by Michael Tully (Septien, Cocaine Angel), the film features heartfelt performances from an outstanding ensemble cast including Academy Award® winner Susan Sarandon, Lea Thompson (Back to the Future, ABC Family’s “Switched at Birth”) John Hannah, (The Mummy, Four Weddings and a Funeral), Amy Sedaris (Strangers with Candy, Amazon’s “Alpha House”), and Robert Longstreet (Pineapple Express, Take Shelter). The nostalgic ‘80’s comedy opened in theaters nationwide and On Demand June 6, 2014. Entertainment Weekly’s Chris Nashawaty raves that Ping Pong Summer is “guaranteed to make you smile,” and Glenn Heath Jr. of Slant Magazine hails the film “A heartfelt retro flashback.” The film has a run time of 92 minutes and is not rated. SYNOPSIS: The year is 1985. Rad Miracle is a shy, 13-year-old white kid obsessed with two things: Ping-Pong and hip-hop. During his family's annual summer vacation to Ocean City, Maryland, Rad makes a new best friend, experiences his first real crush, becomes the target of rich, racist local bullies, and finds an unexpected mentor in his outcast next-door neighbor. Ping Pong Summer is about that time in your life when you're treated like an alien by everyone around you, even though you know—deep down—you're as funky fresh as it gets.